Situated above the dive shop on Lo Dalum Bay, Phi Phi Beach Front Hotel is right on the beach, and enjoys stunning views across the bay. This small family run hotel has the perfect setting with lots of personality and friendly service. All rooms have a fridge, safe, cable TV and A/C, with many having balconies overlooking the sandy bay. Located a short 10 minute walk along the beach into the town this offers the perfect convenience as well as being just away from the hustle and bustle of the centre. There are a host of activities to be enjoyed right on your doorstep, and everything the beach and sea have to offer. The hotel also provides the perfect base to visit some of the local attractions such as; Maya Bay or "The Beach", Monkey Beach, Nui Bay, Bamboo Island, Pileh Lagoon, the Phi Phi Marine Park and the stunning Viewpoint. Making the most of the glorious view and natural light, these rooms have large patio doors extending out onto your very own private balcony. The rooms are also fitted with A/C providing the perfect place to relax away from the lovely Thai sunshine, all with the home-comforts of Cable TV, a safe and a fridge. The hotel also has a Bar and Restaurant, as well as a travel desk for trips around Phi Phi or onward to other destinations. Kayak and Snorkel rental is available. There is also a laundry service as well as collection and drop-off from the pier. If you are looking for something a little more luxurious then our neighbours at Coco Beach Resort have all your needs covered. Phi Phi’s newest resort this luxury naturally styled resort will allow you to relax in style right on the beach. Our Beachfront Restuarant is open for breakfast, lunch and dinner, and also has a mouthwatering snacks menu perfect when enjoying a drink at our Beachfront Bar. The menu contains a mixture of Thai and western dishes, each prepared fresh for your enjoyment. You’ll also have chance to sample the menu on any of our Diving trips with lunch included for your enjoyment between dives. This family run restaurant is authentic Thai in every way, from the Chef's to the local ingredients (many herbs plucked right out of the garden) and the family recipes. Lots of delicious options to choose from, each available as spicy (or not) as you would like. 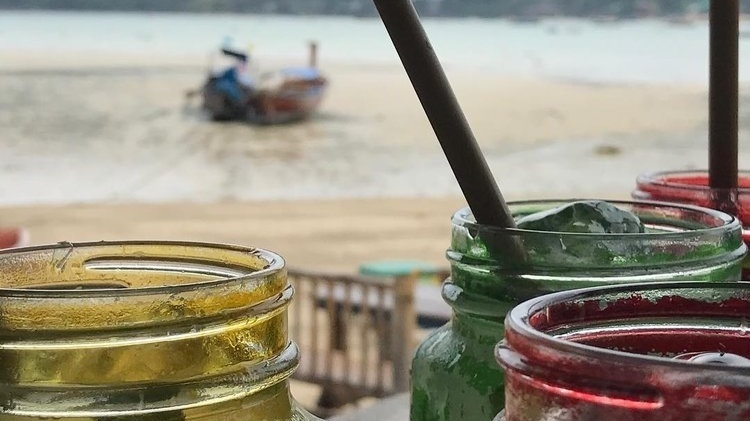 You couldn't ask for more from the location, with tables on the beach; Beachfront is the perfect place to enjoy Thai food in an authentic setting. All manor of delicious cocktails are on offer to get you in the holiday spirit. From classic cocktails to signature drinks and specials, Beachfront Bar will cater to all your needs.